Growing up in New York’s Harlem, Henry Garrett was thrilled to discover that the 300-pound weight set that he ordered had finally arrived. His mother tried to persuade the delivery man to take it to their fifth floor apartment with an offer of ten cents. “I’ll pay you a buck not to ask me for help” was the wisecracking response. Henry struggled but managed to lug his new equipment, piece by piece, up the five floors. Little did he know that this modest purchase would forever shape not only his body but also his life. 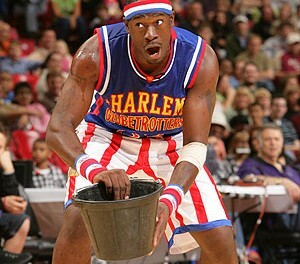 “Hank” progressed to working out at the local YMCA and began competing in body building and powerlifting contests. While at the “Y”, he was approached by another weight trainer and educated on the virtues of becoming a professional wrestler. Veteran grappler Bibber McCoy helped to train the muscular upstart. An arranged meeting with New York promoter and PWHF Inductee Toots Mondt began seventeen year old Hank’s mat career. He soon started working at the local New York and New Jersey arenas billed as Hank Daniels, “The Minnesota Farm Boy”, although he had never stepped foot into Minnesota. The confidence that Hank gained from his chiseled physique also led him to pursue stand-up comedy. Following a short period of time honing his skills in local establishments, teenager Garrett began rotating his evenings inside the squared circle as the “Farm Boy” and in front of a microphone as Hank Garrett. “I was scheduled to wrestle Killer Kowalski in California” Hank recently told this writer, “Killer picked me up at the airport and couldn’t have been nicer to me. We got in the ring and he proceeded to slap me across the face to open the match. I was pretty taken by this unexpected move so I banged him with my best forearm but didn’t even move his feet. I don’t remember the rest of the match but later in the locker room Kowalski said to me ‘Hey Hank, why did you keep running past me in the ring yelling out Mama, Mama ?’ “. Despite five years of competition against many wrestlers including legendary stars such as Lenny Montana, Baron Leone and Mike Mazurki, Hank hung up his wrestling trunks for good and made his way to the Catskills and the Borscht Belt to concentrate on his comedy. A great story teller with a wealth of dialects, Hank cultivated his signature “clean” comic routine working as an opening act for such greats as Tony Bennett, Jerry Vale and Della Reese. He holds the unique distinction of being the first Anglo comedian to ever grace the stage of the Apollo Theater in his Harlem hometown. 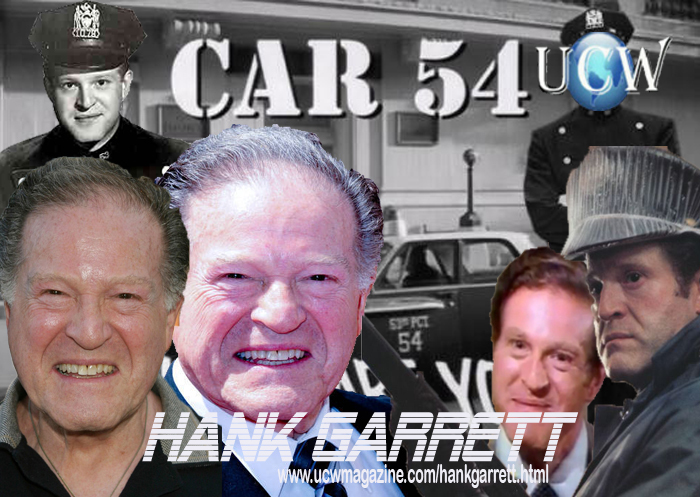 Hank’s first venture into television took place in New York as Officer Nicholson in the iconic television series, Car 54, Where Are You?. California called again but this time it was for another television series in which Hank teamed with James Earl Jones in a show conceived for them entitled Paris. 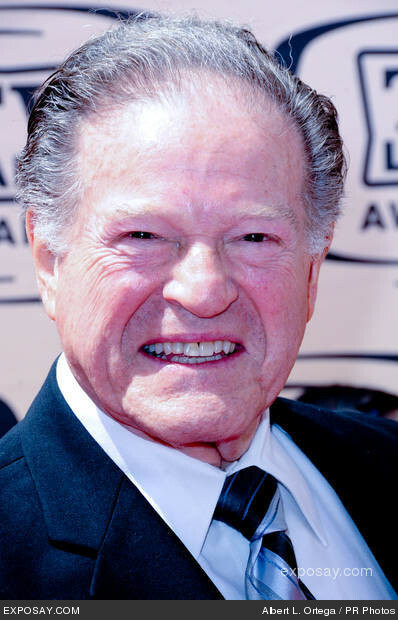 “James was a wonderful actor” Hank stated, “and he probably taught me more than anyone about the profession”. . Garrett has also been featured in a number of other classic episodic television shows such as Columbo, Dragnet, Kojak and The Twilight Zone. Unfortunately, ill-fated stunts have not been uncommon to Garrett. While filming a fighting scene with Amsterdam’s own Kirk Douglas, Kirk reassured Hank that he had never actually hit another actor in all of years of performing. He then proceeded to inadvertently hammer Garrett to the face. Hank graciously informed Douglas that he had just blown his reputation. Perhaps Garrett’s greatest personal satisfaction garnered within the movie industry was winning the New York Film Critics Award for his role in Three Days of the Condor. When I discussed this movie with Hank, I learned he was not always on the receiving end of ill-fated stunts as he jokingly lamented, “I never recall hurting anyone as a wrestler but I accidentally broke Robert Redford’s nose during the filming of Condor.” As a seasoned veteran, Hank lists literally hundreds of credits in movies and television. Today Hank enjoys an active life in Los Angeles where he chooses to perform his crafts without an automobile after being a passenger in tragic accident many years ago. “You meet the most interesting people in both buses and limos” Hank recently stated. Garrett continues to be in great physical shape by pursuing weight training as his hobby and monitoring his diet. He also has had a long time passion for martial arts where he has achieved the status of a Black Belt. and been inducted into the World Karate Union Hall of Fame.